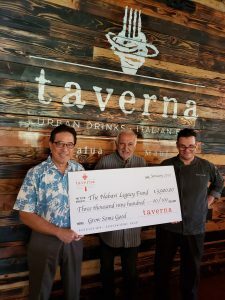 Kapalua’s rustic Italian Restaurant, Taverna, presented a check in early February in the amount of $3,100 for programs benefiting Maui youth. The funds were raised through the Nabavi Legacy Fund dining program where proceeds from a featured dish are collected and donated quarterly to the program by a participating restaurant. 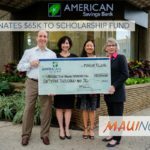 The current beneficiaries list includes Grow Some Good, Imua Family Services, Book Trust, Maui Academy of Performing Art, Maui Food Innovation Center and Americans Heart Association (Kids Cook with Heart). Most partnered restaurants featured one dish, however, Taverna featured two —the Spaghetti Carbonara and Carnivore Pizza. 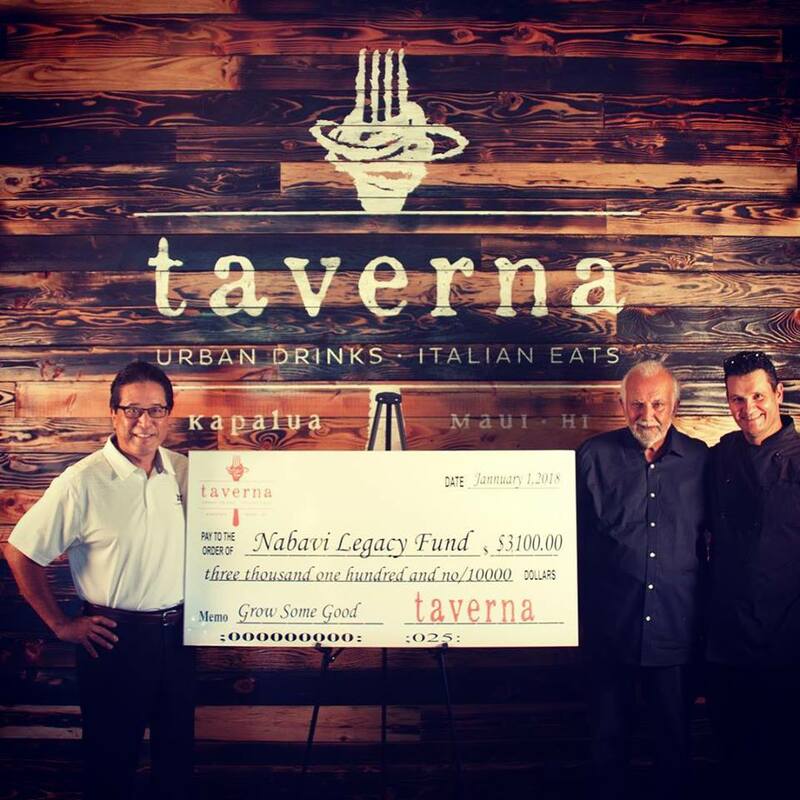 “Taverna is proud to present this check to the Nabavi Legacy Fund supporting six local charities here on Maui. We’re happy to be doing again in 2018,” said Chef Roger Stettler, who’s featured dishes are recipes from his grandmother and mother. “We’re very proud as a local independent business to support the awareness of healthy eating and living— We appreciate the efforts of Paris Nabavi and his desire and passion to bring awareness to the keiki,” Chef Stettler added. Taverna took top honors in 2017’s Maui Nō Ka ‘Oi Magazines ‘Aipono Awards. 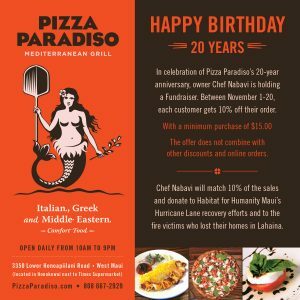 Best New Maui Restaurant 2017; Best Bar 2017; Best Italian – Silver 2017. 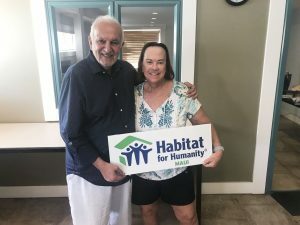 The Nabavi Legacy Fund was created by Chef Paris Nabavi and his wife Donna to support programs that nourish the minds and bodies of Maui’s children. As Maui restaurateurs, foodies, and parents, the couple has an interest in educating kids to eat healthy, make sustainable food choices, and develop a lifelong love of learning – all while having fun. For more information about Nabavi Legacy Fund, click here.